Hans Melzer saw the grey mare in 2014 being ridden cross country by Marina Köhnke and suggested her to me. Her new name “Weisse Düne“ ( White Dunes) came from Norderney ( an island off the North Sea of Germany) . That is where we got to know her and fell under her spell. 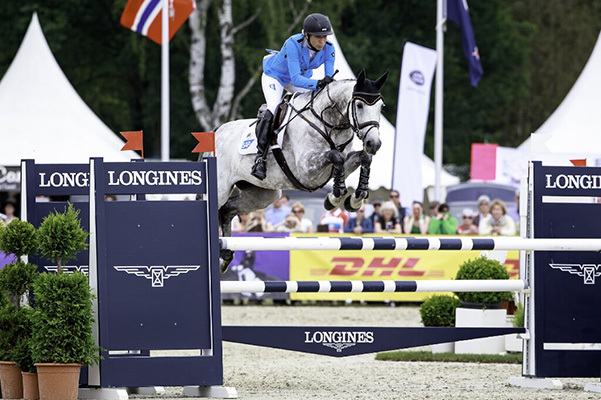 Her stable name is “Biene” and she was bred by Hanno Köhncke. I am very glad that Weisse Düne has had such a good upbringing and training. She has already won cross country classes at A level and has all the attributes one could wish for. Biene has good elastic paces and an especially big and light footed canter. She has natural talent for jumping and is bold cross country. Weisse Düne is impressive with her grace and scope over a fence. She is a curious and good natured mare with that something special. Everyone loves her with her trusting and attentive character. She has already come second in her first outing with us, ridden by my Bereiter, Philip Weßling. 6 year old, she was with Philip 6th at the Bundeschampionat in the final. In Le Lion d’Angers at the World Young Event Horse Championships Biene competed in the CCI* class. In the dressage she was great, concentrated well and made a good impression. In the cross country she galloped and jumped really well. Unfortunately we had an unlucky refusal but made up for this with a lovely clear round show jumping. With this she showed us the great potential she has. 2016 saw us grow together even further. We were successful in multiple CIC1* und CIC2* and placed in “Dressage horse” M tests. It is so much fun training Biene- whether we are riding out, going hunting or just doing every day work, she is always happy and motivated. 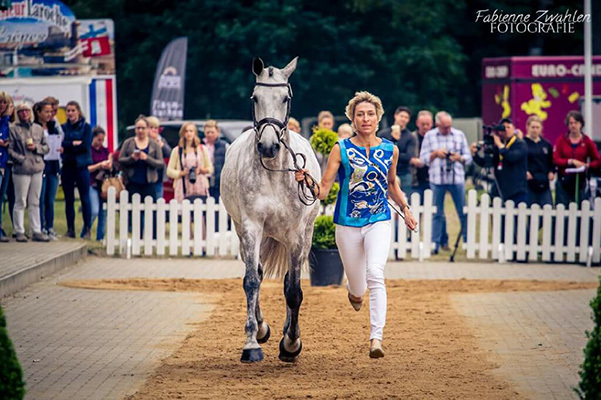 Weisse Düne led from start to finish in Le Lion d’ Angers, galloping home to win the 7 year old Event Horse World Champion title. In the 2017 season she had success in all disciplines. Weisse Düne won M level show jumping classes as well as being placed in M level dressage tests. She moved up to three star level eventing, going well at Sopot and placing at Luhmühlen CIC***. Weisse Düne will not be presented at competitionsin 2018, as she unfortunately has to take a break for health reasons.